A scientific survey conducted June 11-14 of voters who said they were likely to vote in the Republican primary for U.S. Senate in 2016 shows incumbent Senator Johnny Isakson already receiving 50 percent of the likely vote. The poll also indicates that most voters believe his recent disclosure that he has early stages of Parkinson’s disease would lead them to be more likely to support him for re-election, or would have no impact on their vote. Crosstabs can be found at the bottom of the page. 1. Considering the 2016 primary to choose the Republican nominee for United States Senate, for whom would you be most likely to vote? 2. How does Senator Isakson’s announcement that he has early stage Parkinson’s disease affect your vote? Analysis: Isakson’s re-nomination percentage is actually a few points higher than we have been seeing for other successfully re-nominated GOP incumbents in recent years. These so-called “re-elect” numbers are usually very low for incumbents, particularly U.S. senators, because they are not as frequently on television or a top headline in newspapers, given that their work is in D.C. Once U.S. senators take to the airwaves, their name identification rises. 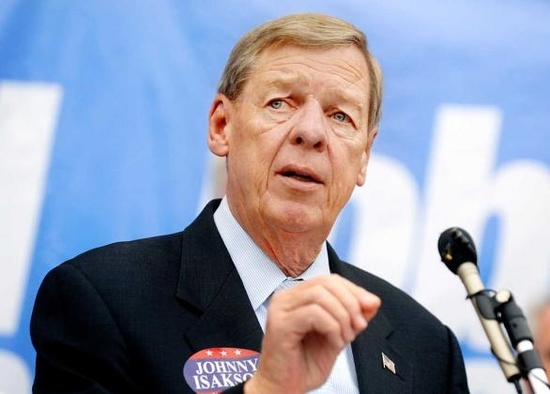 We know that Isakson will be in a Republican primary race, since one candidate has already announced his intention to run. Should Democratic opposition announce, we will poll the potential General Election ballot. But that would be premature at this point, given that the contest is basically a year-and-a-half away. As for his disclosure of Parkinson’s, Isakson actually nets a 10 percent bump in his likely vote for re-nomination, suggesting the issue may work in his favor this coming year.